Preheat your oven to 350 F and grease one 9x5x3 loaf pan. In a small bowl (cereal bowl is reasonable) sprinkle about 1 cup overripe, mushy Raspberries with your 1-2 TBSP. of your choice sweetener. Let set. In a large bowl, combine 2 cups All-Purpose Flour , 1 1/2 Tsp. Baking Powder, 1/2 Tsp. Baking Soda, 1/4 Tsp. Salt. Set aside. In a medium bowl mix together 2 Eggs, 1 1/2 cups Bananas, 1 cup Sugar, and 1/2 cup Vegetable Oil Add egg and banana mixture to flour mixture, stirring until just moistened. Give raspberries a quick stir, breaking down any bigger berries, before folding into the bread batter. Spoon batter into prepared loaf pan and transfer to the oven where it'll work a bit of chemistry and magic over the course of 55-65 minutes until a toothpick inserted in the center comes out clean. 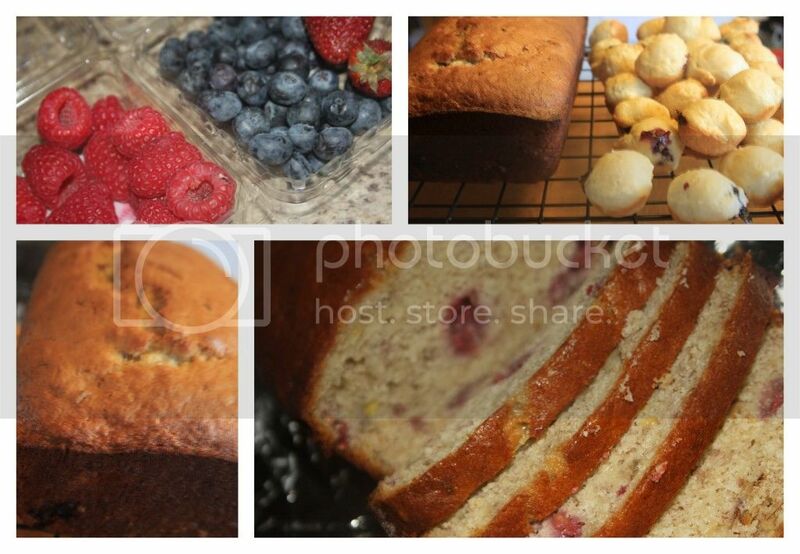 Learn a little more and take part in some banana bread discussions here at Squidoo!